Colosseum: Road to Freedom (originally Gladiator: Road to Freedom in Japan) is a video game for the PlayStation 2 console. It is a hybrid fighting/RPG game loosely based on the Roman Empire around the time of the Emperor Commodus. 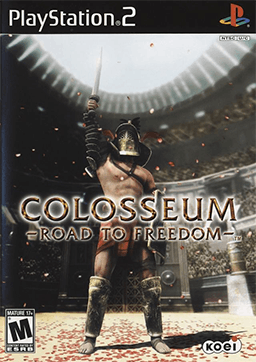 Colosseum: Road to Freedom has the player take on the role of a slave that must partake gladiatorial games in order to earn enough money to purchase his freedom. The majority of the game is spent training the player's character and fighting in arena battles. The story in Colosseum takes a backseat in order to allow a higher degree of open-ended gameplay. Players have the freedom to tailor their game avatar to their liking depending on how they answer questions prior to gameplay. Depending on the player's performance, it is possible to pay off the character's debts and still remain a freeman gladiator. The game allows for multiple endings depending on the player's performance over its course. Laetus: An associate of Marcia, whose true colors will be revealed on later in the game. Magerius, Gnaeus, Decimus, Celadeus: Magerius is the player's owner for the majority of the game and he runs a gladiatorial training facility. Gnaeus, Decimus and Celadeus are responsible for one's training. All special fights in the Colosseum pit the player's character against other named gladiators. The game received "mixed" reviews according to video game review aggregator Metacritic. In Japan, Famitsu gave it a score of one nine, one eight, and two sevens, for a total of 31 out of 40. On September 1, 2005, Ertain and Koei released Gladiator: Road to Freedom Remix which contains a few updates to the game. A sequel called Gladiator Begins was released in 2010, and a second one called Clan of Champions was released in late 2011. 1 2 "Colosseum: Road to Freedom for PlayStation 2 Reviews". Metacritic. Retrieved February 12, 2016. ↑ EGM staff (August 2005). "Colosseum: Road to Freedom". Electronic Gaming Monthly (194): 113. ↑ Gillen, Kieron (September 26, 2005). "Colosseum: Road to Freedom". Eurogamer. Retrieved February 12, 2016. 1 2 "New Famitsu scores". NeoGAF. February 8, 2005. Retrieved February 12, 2016. ↑ Miller, Matt (July 2005). "Colosseum: Road to Freedom". Game Informer (147): 119. Archived from the original on November 4, 2005. Retrieved February 12, 2016. ↑ Manny LaMancha (August 2005). "Colosseum: Road to Freedom Review for PS2 on GamePro.com". GamePro: 77. Archived from the original on March 19, 2006. Retrieved February 12, 2016. ↑ Silverman, Ben (August 18, 2005). "Colosseum: Road to Freedom Review". Game Revolution. Retrieved February 12, 2016. ↑ Mueller, Greg (July 28, 2005). "Colosseum: Road to Freedom Review". GameSpot. Retrieved February 12, 2016. ↑ Leeper, Justin (July 20, 2005). "GameSpy: Colosseum: Road to Freedom". GameSpy. Archived from the original on December 17, 2005. Retrieved February 12, 2016. ↑ Lafferty, Michael (July 11, 2005). "Colosseum: Road to Freedom - PS2 - Review". GameZone. Archived from the original on October 5, 2008. Retrieved February 12, 2016. ↑ Lewis, Ed (July 19, 2005). "Colosseum: Road to Freedom". IGN. Retrieved February 12, 2016. ↑ "Colosseum: Road to Freedom". Official U.S. PlayStation Magazine: 83. August 2005. ↑ Hruschak, PJ (August 31, 2005). "Colosseum: Road to Freedom". CiN Weekly. Archived from the original on December 1, 2005. Retrieved February 12, 2016.